So where were the tourists with cameras really looking? For me you can keep your City Hall; the most splendid sight in Stockholm has got to be this. 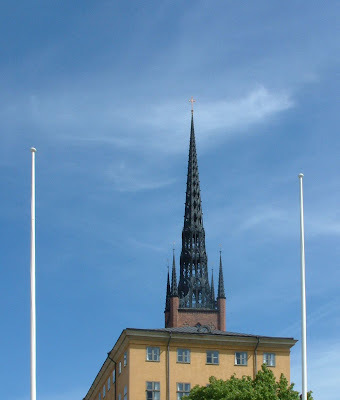 The Riddarholmen Church (Riddarholmskyrkan) originally belonged to a Franciscan friary but was much altered in later centuries. The cast-iron steeple built in 1841 is 90m/295ft high. The burial-place of the Swedish monarchs, since 1807 the church has been used only for burials and memorial services. I don't know what it is, but maybe it just reminds me of home. The steeple is impressive. Sounds like the church is rich in history.